Dingoes: The Dingoes are a new fairly new group of students rebuilding group culture, while excelling at teamwork throughout the week. The group went on several hikes with two additional peak hikes. We witnessed solid teamwork as the group assisted other members of the group that were struggling on the hike. While the peak hikes appeared daunting, the excursions helped the group recognize how initiating actions is sometimes the hardest part. With false summits on the peak, students wanted to give up, symbolizing the further difficulty of finishing things that have been started. Token and trail name ceremonies were conducted while on the peak. The group started their own water bottle of notes of encouragement to future students on one peak; a common Outback practice. Lastly, the therapeutic theme centered around identity, so we spent some time looking into how performing for others influences who we are. Gnowees: The Gnowees had a great week this week. A couple of the girls were not feeling their best, but they stayed strong and pushed through. We had some great hikes with lovely views that reminded us of paintings. Later in the week, we had a rest day that allowed for all the girls to work on their busting which gave them ample time to work on making spoons, possibilities bags, and moccasins. This week two Gnowees received” their trail names, and one of them received a token. They were really invested in the book “The Borrowers”, which we read every night and during all of the hikes. Two Gnowees were reunited with their parents this week and had a great time showing them everything they learned from being out in the wilderness. 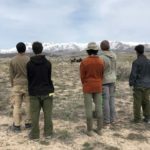 Goannas: The group had a monumental week as veteran members moved on from the Utah desert, and newer members began reshaping the culture around the group. The group is making it a focus to take pride in hiking, fire busting, and group gatherings. We had a gathering creating new group pillars and the group chose the following: Brotherhood, Openness, Accountability, and Respect. The current members will be leaving a legacy and having a lasting effect on the group culture. We enjoyed several hikes this week, including a packs-off day hike to some old Native American petroglyphs. We enjoyed the warm and sunny weather as we welcomed in two new members of the group. One member received their trail name this week, and another got to spend a day with his parents as they traveled to visit him and experience life in the desert. Brumbies: This was a beautiful and relaxing week in the desert for the Brumbies. The group had one of our most challenging hikes earlier in the week that really tested our toughness and resilience. We ended the week with a parent visit and a couple of token ceremonies at a site with a magnificent view. The boys were consistently acknowledging each other through ceremonies and meaningful feedback throughout the week. Overall this week for the Brumbies was full of games, vulnerable gatherings, and fun skills!